Amelia was created to conform with the acclaimed HinsonGayle multi-use rope design. Her lustrous white pearls contrast perfectly with the deep purples of her clear amethyst chunks. Amelia is composed of two separate ropes and is an extremely versatile piece that can be used to create countless distinctive necklace looks when worn with her sterling silver pearl enhancer. Both ropes can also be worn as stylish wrap bracelets. Some of HinsonGayle's favorite looks include wearing her separate strands individually or together as full length ropes, creating various complex twisted torsade looks, draping one rope at full length while doubling the second strand, or simultaneously adorning a necklace and wrap bracelet. With seemingly unlimited possibilities, Amelia is the perfect 'piece' for anyone who never wants her jewelry to go out of style. 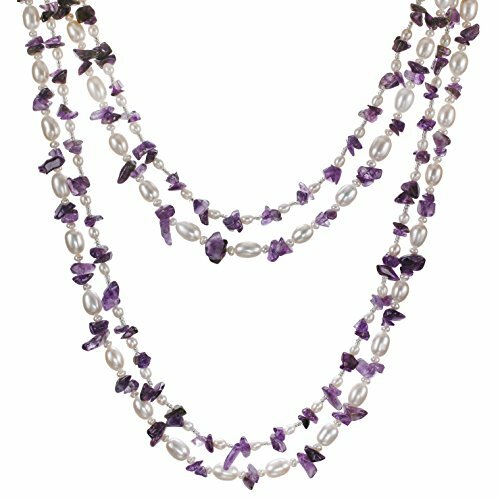 This head turning double-rope design is handcrafted from a handpicked assortment of genuine cultured freshwater pearls, amethyst crystals, and shimmering beads. Gemstones may have been treated to enhance their appearance and durability. An acclaimed HinsonGayle multi-use double rope design. Amelia's lustrous white freshwater cultured pearls contrast perfectly with the deep purples of her amethyst chunks. The two unique and differently styled ropes will turns heads and tap into your creative side....wear them layered, individually or twisted with the included silver pearl shortener clasp. Click on the images for more draping ideas. There are even more ways than shown to wear her; go ahead, get creative and have fun! Handcrafted from amethyst chips, lustrous freshwater pearls, and glistening beads. Gemstones may have been treated to enhance their appearance and durability. Wear as necklaces or wrap bracelets. Includes two endless ropes that are approximately 40 inches each. The premium 925 sterling silver clasp is rhodium plated for enhanced scratch and tarnish resistance. Set includes a pair of matching dangle earrings. The quintessential stress-free gift; HinsonGayle's luxurious signature gift box will impress her. Includes a cloth pouch to store and protect your HinsonGayle pearls for generations to come. If you have any questions about this product by HinsonGayle Fine Pearl Jewelry, contact us by completing and submitting the form below. If you are looking for a specif part number, please include it with your message.